Totally focused and oblivious to his surroundings, the young man speaks urgently but quietly into his headset. One hand hovers above the keyboard, the other on the computer mouse. On the monitor screen in front of him a virtual figure is chasing through a labyrinth of alleys and dead-ends, veering off, flattening itself against walls, reacting to opponents – all this happening at split-second commands. The speed with which these cyber scenes unfold is breathtaking. It’s like being taking along for a spin with a Formula One pilot. This is Kai “Kaii” Schäfer, one of the best German professional gamers, at work. Together with Thermaltake, renowned provider for electronic gaming accessories and based in Taiwan, BMW Group’s think tank of creative specialists, DesignworksUSA, has developed a high-end computer mouse specifically for tech pros like Schäfer and all those dedicated amateurs hoping to match their wits against the lightning-fast best. You need a speedy mouse for this. This piece of technology, resembling a tiny race car, has about as much to with those grey plastic shells scooting over mouse pads like a family van does with a high performance supercar. Niko von Saurma, the director of the Munich studio of DesignworksUSA, takes up one of the three prototypes and handles it with the care afforded a rare artifact. And that is what this sleek concoction, outfitted for the rigors of professional computer sports, is set to become. 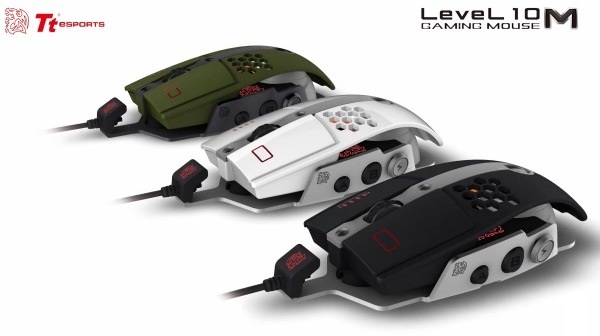 Officially, this latest innovative example of industrial design is called Pro-Gaming Computer Mouse Level 10 M. Anyone who’s ever tried their hand at a computer game knows that Level 10 is reserved for the very, very good. Someone like the pro-gamer “White Ra”, who shared his first-hand experience during the developing process. Level 10 M has the potential to become a “game changer”, says Tony Liu. For the director of Tt esports, the gaming division of Thermaltake, “the mouse is an extension of the player´s soul”. It is no less than the conduit into the game. Just like a basketball shoe, a golf club or a cockpit, a professional´s mouse needs to be customized to meet the competition needs of tech’s best athletes. DesignworksUSA’s mighty mouse does indeed fulfill the mantra of every designer: form follows function. It is a two-part construction, with the upper half seeming to float above the base. Made of an alloy also used in aeronautics and architecture, Level 10 M is both lightweight and immune to corrosive effects. The top part, where the gamer’s hand would be resting for hours during competitions, can be individually adjusted for height and lateral inclination. The mouse is also outfitted with a number of keys, which a gamer can set to meet specific demands. The software packed into the stunning hardware is also able to read out DPi-rates for gaming visuals. The drilling in the upper shell serves to ventilate a player’s palms during the game – even top-seeded gamers break into a cold sweat at heart-stopping moments. As a special highlight this mouse can even be illuminated in different colors. This has now been the second project where Thermaltake and DesignworksUSA pooled their respective resources. The first was the Level 10 computer chassis, which made a huge splash in gaming circles. With a computer up and running and a mouse set to go, both companies are contemplating enlarging the Level 10 gaming portfolio of must-haves. The blogosphere was buzzing with anticipation when the designers and Thermaltake together presented their high-tech mouse at the international computer fair CEBit in Germany in the spring of this year. Equally at COMPUTEX Taipei in the early summer the mouse received a lot of praise and positive feedback in the web as well as the “COMPUTEX Design and Innovation”-Award. The Level 10 M Mouse is an ingeniously designed piece of High Tech. The greatest challenge for the designers was to translate the geometric language of the lead product, the Level 10 Computer chassis onto a piece of equipment which naturally asks for ergonomic solutions. DesignworksUSA profited from its vast work for a great variety of industries far from the automotive world in which the designers discover trends, new phenomena and design developments in order to create world class creative solutions for its mother company BMW Group as well as for other clients outside the automobile field. Game or Sports? The New Formula 1 of Tomorrow? Two of the most popular electronic games at the international meets drawing pros are car racing and football. To compete at a high level in computer and video games demands the same set of skills as spending off-time with a Nintendo or Playstation set-up at home: hand-eyes coordination, reaction time, spatial awareness, control and tactical acumen. Except that these talents have been honed to the expertise that separates a weekend golfer from a Masters champion. In this business success is a matter of split seconds. Professional gamers, especially those qualifying for the annual World Cyber Games, train as seriously and assiduously as their more physically oriented counterparts in the real world. Putting in six to ten hours per day, immersed in the augmented reality of their virtual game scenario, navigating mouse and keyboard at the blink of an eye, is necessary in order to compete against the best in this brotherhood. But these computer athletes also need to train physically to have the stamina for twelve-hour bouts and often spend time in a kind of boot camp to prepare for the big events. Contrary to the geek image of gaming, players aren’t generally loners, however, but form teams that are financed and outfitted by sponsors such as the Apollos, that sport the Tt esports colors. In gaming circles these groups are called clans, based on a legendary computer game called “Quake”. What draws the young gamers to this form of sport is not just the thrill of performing at Level 10. By now there is big money involved. Winners can easily cash into a million dollars, much like the top poker stakes, not least because big-name sponsors like Nike and Pepsi-Cola have discovered the hip allure of e-sports for themselves. A good professional can earn up to 250 000 dollars a year. Within Asia there are special stations televising the competitions, with the US and Europe following lead. For these TV shows, the pro teams get trained, styled and coached for the public show down. There are gaming stars in this locked-in world of halls full of busy computer screens just as there is the usual media hype. It is only really since the eighties that the fledgling virtual world began offering a state of play. Ever since the advent of home computers, the rise of the Internet and faster and more powerful broadband technology has electronic gaming evolved into that – still somewhat hidden – mass phenomenon. Tony Liu pointed out, that at times up to 15 million people are online to play a game. Which is also why it was a real-time, real-world disaster when Sony’s online gaming platform was hacked, disclosing account holders’ data. ● 3D Steering Axis Movement: The Mouse is divided into lower and top part which seems to float over the base. This part which is also the essential steering element of the mouse can be adjusted in regards to height and angle. The 3D dimensional character of the mouse provides for new and highly sufficient axis movements in various directions and makes the mouse fit as many gamers’ preferences as possible. ● Solid Aluminum base: Commonly used in the aerospace industry and in architecture, this material is characterized by its high resistance to corrosion. It ensures that the user’s Level 10 experience is durable and resilient to mouse-gliding movement. ● Air-Through Ventilation System: Additionally the Mouse is fitted with exquisite texture – a perforated surface which provides for a better air and temperature exchange as a means of passive ventilation, solving issues due to heavy use and direct touch of gaming equipment and the rise of temperatures of the hand. ● Intelligent Software Application: The Level 10 M Mouse is a programmable gaming mouse capable of using the most comprehensive software application to customize settings based on user’s needs. The Mouse has 2 regular keys on top and 5 additional keys at the side. Each key is programmable by software application by a single press with the finger. The so called “Z” key is especially designed for 5 different commands. There is a total of 11 programmable command keys on Level 10 M Mouse while the “Z” key offers another function: During the gaming mode this key can switch between up to 5 gaming profiles. In addition, the polling rate and the 7 lighting-effect colors of the Mouse are also customizable. The Level 10 M Mouse is equipped with 8200 DPI, adjustable from 800, 1600, 3200 to 5000 (default setting), and customizable by software application up to 8200 DPI. The Function-Lock Mechanism also serves to avoid accidental error command by locking side keys during gaming mode. As of August 27th, 2012, the mouse will be available at most major retailer stores and online stores in the US, in Europe and Asia. The Level 10 M Mouse will also be displayed at Tt eSports’ website at www.ttesports.com. Available in four colors: Diamond Black, Iron White, Military Green and Blazing Red. Sales price will be around 99 US Dollar.